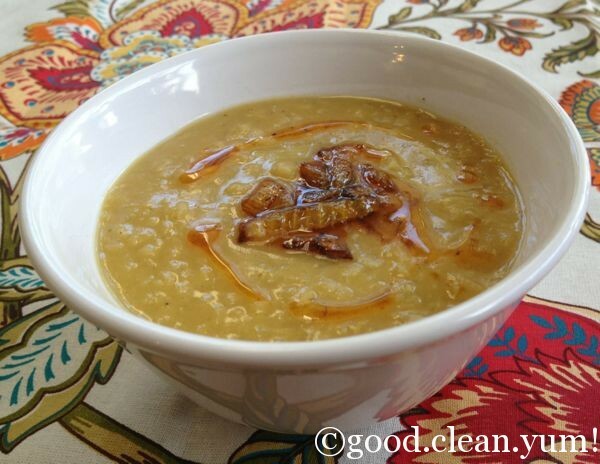 Lentil Soup with Smoky Onions | good.clean.yum! I now love and appreciate the magical way orangey-red lentils turn a golden hue when they are cooked. However, it did take me a while to get to that place of love! I vividly remember the first time I cooked red lentils – I was surprised and disappointed by their transformation. I had expected them to retain their orange hue but there they sat in my pot – undeniably yellow! Why had I not known this would happen? Why hadn’t anyone warned me? Now what was I going to do with yellow when I was expecting orange? I completed the recipe, and although the dhal tasted great, all I could really focus on then was my disappointment with the color of those lentils. I have since cooked with red lentils many times, but always with a twinge of regret that their gorgeous color would transmute into golden yellow. 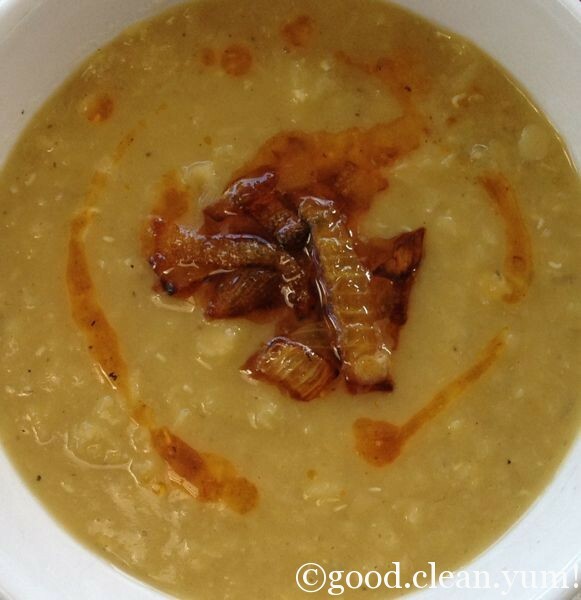 As I set out to create this soup, I knew I had to get over my pettiness with the red lentils! I mean really, how often in my life have I expected a situation to go one way only to have it do a complete 180 and catch me unprepared? After my initial surprise/shock/disappointment/resentment in those situations, I eventually realize I have to pull myself together to find the gift in it. And there is always a gift and a lesson. These were only lentils; surely I could manage to get over my reaction! I wanted red? Okay, make it happen! And that’s how the smoky onion garnish came to be. 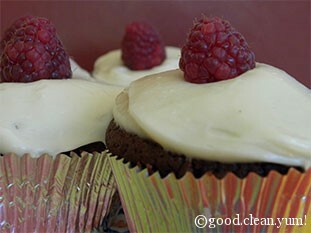 Not only is it a burnished red color, it adds a hint of delicious deep flavor. And my heart is now completely happy with my lentil soup! The first time I ate lentil soup was in a Lebanese restaurant in Toronto. They served it with lots of lemon wedges to squeeze into the soup as it’s served, and it has since become my preferred way to eat it: slightly tangy from the fresh citrus. 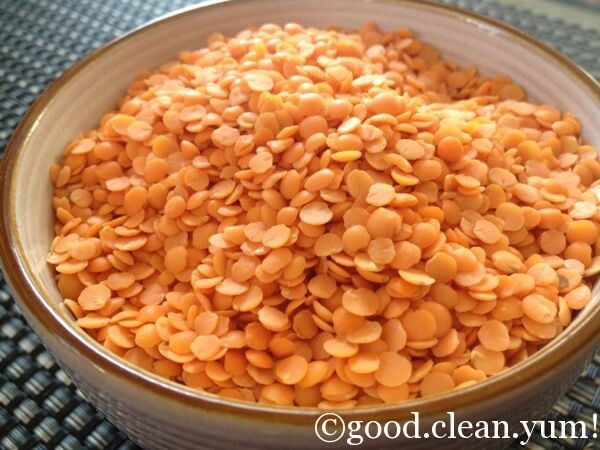 Lentils are a legume and are a good source of cholesterol-lowering fiber, folate and magnesium. They help to boost our body’s iron stores and stabilize blood sugar levels. In a stockpot add in the onions, lentils, water (or stock) and ½ teaspoon salt and ¼ teaspoon pepper. Bring to boil and reduce the heat to simmer and simmer for about half an hour or until the lentils have disintegrated. Add in some extra water if the soup seems too thick. Stir in the cumin, lemon juice and lemon zest; adjust the salt and pepper to taste. 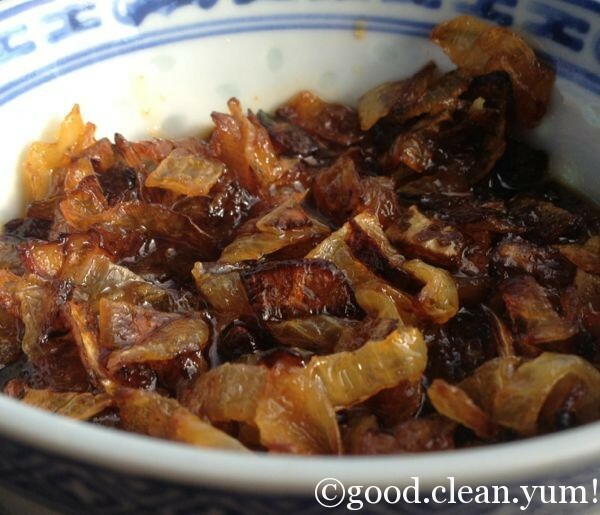 Fry the onion in the olive oil on medium heat until the onions are very browned and caramelized. Add in the smoked paprika and stir for a couple of minutes to blend the flavors together. Garnish each serving with a tablespoonful of smoky onion garnish and serve with fresh lemon wedges.